To help users browse websites more securely, Google has announced that the latest release of its Chrome browser will mark all unencrypted HTTP sites as “not secure” in the browser URL. This is part of Google’s plan to discourage use of sites that don’t use appropriate security measures and to transition web traffic from potentially insecure HTTP to the safer alternative HTTPS sites. Older versions of Google Chrome cannot indicate whether HTTP connections are secure. This means that when users access a site using HTTP, a hacker could intercept login information, passwords or payment data, increasing the opportunities for fraud. A recent Google study identified that the current neutral indicator in the web browser has little impact on users, and a “not secure” warning is more effective. In labeling HTTP sites more clearly and accurately Google aims to give users more reassurance when using certain websites. Ultimately, Google plans to label sites that continue to use HTTP with a red warning triangle to indicate that these sites are not functioning securely. Beginning in January 2017, Google’s Chrome 56 browser will label HTTP pages that include sensitive information, such as password or credit card fields, as “not secure”. HTTPS ensures that when a user accesses a website, this data is encrypted using the Secure Sockets Layer (SSL) protocol or the more modern version, Transport Layer Security (TLS) protocol. In order to implement HTTPS, site owners must obtain a trusted digital certificate for each of their sites. Google reports that HTTPS usage is increasing substantially and that a significant portion of web traffic has transitioned to HTTPS to date. What are the benefits of encrypting my website? Is the change in Google Chrome relevant to individual pages or the entire site? Browsers are looking at pages, so as pages appear they examine them for password or credit card fields. If these fields are present, the site will be flagged. If no fields are present, the site is not flagged. Any pages within the site that are flagged need encryption to prevent browser warnings indicating the page is not secure. My site isn’t e-commerce, why is this important? Sensitive and personal data is not limited to e-commerce websites. Examples are e-mail accounts (access to an e-mail account can lead to many types of abuse) or passwords being shared for different services. That's why Google does not differentiate between types of websites. Will my internal pages, not accessible to the general public, be subject to the same warning messages? This is a change controlled at the browser level, not at the user level. So, you’ll still have the error messages for internal sites lacking HTTPS, which could cause confusion for users within your internal environment(s). How can I prioritize which pages to secure? At a minimum, start with password and credit card pages as we know these are pages that will be impacted by this change. Then, begin looking at other pages. A best practice for prioritization purposes would be to address the pages on your site with the highest traffic, as these will be visited the most and have the highest chance of a negative user experience when error messages are displayed. Speaking of Google, will not having HTTPS impact my search ranking? Yes, sites with HTTPS are given preference in search rankings (which has been widely publicized), so it goes to show that using HTTPS is important for your SEO activities. What can I do next to secure my website? Lexsynergy has a streamlined process for purchasing and managing SSL certificates. 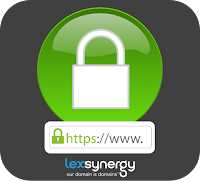 Simply login to your Lexsynergy Account and navigate to the SSL tab. There you can choose from top brands like Symantec, GeoTrust, Thawte, RapidSSL and Comodo. If you need assistance purchasing an SSL certification contact your account manager or email us at support@lexsynergy.com.